Dinnerly Reviews - Is it a Scam or Legit? Dinnerly Review: Should You Use It? 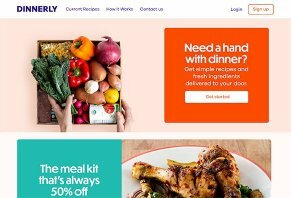 Dinnerly is a subscription meal kit that promises to help you put dinner on the table for just $4.99 per serving. Launched by Marley Spoon, Inc in the west coast in the middle of 2017, Dinnerly has since expanded across most of the continental United States. At the time of writing, the company offered a subscription service that lets you choose the amount and frequency of an ever-rotating roster of meals, ensuring that you deal with one less decision each night. However, Dinnerly is far from the only meal kit company competing for customers today, and it’s difficult to know which one makes sense for your situation. Should you choose Dinnerly? Looking through these details should help you decide. In the competitive world of meal kit subscriptions, Dinnerly brands itself as a budget option that offers “unfussy, affordable weeknight meals.” The brand focuses on providing customers with fresh ingredients and simple recipes that take less than thirty minutes to prepare. One way that the company strives to cut costs is by streamlining their product. For instance, their website states that most meals contain fewer than six ingredients, and customers can download and print recipe cards from their online account. Other meal kit brands, in contrast, like Blue Apron and Plated include them with the food. CNBC states that Dinnerly also works to keep things cheaper by minimizing their packaging and spending less on marketing. For example, if two recipes call for the same ingredient, the company will provide it in one package. Even so, the company makes it clear that they don’t skimp on ingredients. Their website states that they source ingredients like grass-fed ground beef and antibiotic-free chicken for many of their meals. When I tried Dinnerly food, I received grass-fed beef for hamburgers, certified organic canned tomatoes, and a variety of fresh ingredients that all looked as fresh as the options in the grocery store, giving me no reason to doubt these claims. Do Subscription Meal Kits Make Sense? Meal kit services might sound like a new idea, but Money Magazine tells us that the industry has grown so large in five years that it poses a threat to grocery stores. Packaged Facts reports that over 100 meal kit subscription services are available today, ranging from pre-made food to raw ingredients conveniently prepped for you. But is there reason to join the trend, or are there drawbacks from relying on a subscription meal service? According to Packaged Facts, the people who sign up for meal kit delivery services cite numerous reasons why they do so. For instance, meal plans save time and stress of regular grocery shopping, lead to less food waste, and potentially introduce users to new cooking techniques or ingredients. As we previously reported in our article about meal kit services, these plans save the average home chef time in numerous ways, including planning meals, purchasing groceries, and prepping ingredients. This alone makes a meal kit service worth investing in for millions of people. Now, let’s look closer at the details behind Dinnerly to see whether this is a subscription meal plan worth considering. How Does a Dinnerly Subscription Work? At the time of writing, Dinnerly offers two subscription options: a 2-person box and a 4-person “family” box. Each plan provides three recipes per week, for a total of six and twelve servings of food consecutively. Dinnerly is expanding their service across the continental U.S. Though delivery isn’t available in some rural regions, the company currently ships throughout much of the United States. This information will change often, so the best way to determine whether Dinnerly is available near you is to search with your zip code. After choosing your plan, you might have the option to select your preferred delivery day and time slot, though some zip codes are only available on certain days of the week. For instance, my region of West Michigan only offered delivery on Tuesdays between 9am-9pm. The website states that the food would arrive in a cold box with ice packs and insulated liners. In optimal conditions, your meat, fish, and dairy products should all last for at least four days in the fridge. This fit my experience, as my Dinnerly box arrived precisely when it was supposed to, with all ingredients intact and the ice pack still fully frozen. A few crucial ingredients (such as salt or oil) won’t be included in your order, though the brand will let you know if you need them beforehand with your shipping confirmation. For me, this was a minor hurdle when I realized two of my recipes called for eggs, which weren’t included in the order. Dinnerly’s website states that they make it simple to pause, cancel, or edit your order. The time varies by region, but most people can make changes as late as five or six days before their delivery. It’s also possible to sign up for a flexible subscription, which gives you the freedom to decide which weeks you want to receive Dinnerly delivers and pay only for those weeks. For further clarification, you can contact the company directly through email (hi@dinnerly.com) or by phone (888-267-2850). Allergy sufferers often find it difficult to make do with the relatively inflexible nature of meal kits, and Dinnerly seems to be no exception. The company states that it provides full ingredient and allergen information for each recipe, but doesn’t offer full menus to fit the requirements of specific diets. Likewise, they acknowledge that all recipes undergo the same production process, so cross-contamination is possible. In other words, sufferers of severe allergies should be aware that they are taking a slight risk when they choose to cook with any meal kit, including Dinnerly. As we mentioned previously, Dinnerly advertises itself as a $4.99 meal plan, which means each serving costs about $4.99 (before shipping). The brand offers two meal plans: $29.94 for three dinners of two servings each, and $59.88 for three dinners of four servings. In both cases, the shipping costs come to $8.99 per box. If you’ve looked closely at any of Dinnerly’s competition, you know how many meal kit companies exist today. Each kit is at a slightly different price point and attracts a different demographic, so knowing some of these details makes it easier to make a comparison between them. We assembled this chart of popular meal kit companies to make that decision easier. This chart makes it clear that subscription meal kit services range in price, cooking difficulty, and, well, range. It might be helpful to think of Dinnerly on one end of the scale, and a company like Plated on the other. Dinnerly is targeted at people who like to cook from home but don’t want it the process to be pricey or time-consuming. The recipes are streamlined with simple instructions and fewer ingredients than other meal kits. A brand like Plated, in contrast, costs more per serving, takes longer to prepare (on average) and typically utilizes more ingredients per recipe. Deciding which approach makes the most sense for you comes down to identifying your goals with dinner. In our view, Dinnerly is an option best suited for those who want to put affordable food on the table without as much thought or effort as going to the grocery store entails. If you want to get an idea of what previous customers think of Dinnerly, the company’s Facebook page is an excellent place to start. Perhaps unsurprisingly, a number of the comments on the page were from customers having problems with their order. Numerous reviews we read mentioned that missing ingredients was a common problem. Some reviewers stated that they never received a box that contained everything promised inside, and others noted that some of their produce was past its peak. Others complained that customer service was unresponsive to their concerns, and that their boxes came several days later than promised, leading to spoiled food. This didn’t match my experience, as customer service was prompt with replying to all my questions, and each ingredient I received was in peak condition. Other reviews on Facebook were much more positive and praised the food quality and variety. Insider.com has a published review that is lukewarm at best about subscription meal kits, specifically Dinnerly. Though writer Joanna mentions that she appreciated the allergy information on the packaging, the ingredients for multiple recipes were packed together, and they weren’t sorted or labeled. This made it difficult to determine what went with each meal. Even so, Joanna reported that the recipes were easy to follow, though the instructions needed some corrections for cooking times, which could lead to stress for cooking weeknight dinners. A review by The Daily Meal is similar in sentiment. Writer Taylor Rock noted that Dinnerly’s portion sizes were generous, meaning that a four-person meal actually fed six (though still at a higher cost than buying the ingredients at the grocery store). My experience was different, as I thought the protein servings seemed small for two people and my husband and I needed to supplement one of our meals with extra food. Taylor also noted that her box’s ingredients weren’t packaged attractively and that a few key ingredients were substituted for ones she had offered, making it impossible to follow one of the selected recipes. Like the Insider review, she noted that the cooking times seemed inaccurate. A lack of expiration dates on the produce was also off-putting, and she stated that the price seemed high for the quality of ingredients. Finally, a collection of reviews from Trust Pilot agreed with the same sentiments we saw on Facebook, mainly that ingredients were missing from the boxes and that customer service was difficult to deal with. It’s worth repeating though that reviews on these sorts of websites tend to skew negative, so they might not provide an accurate representation of the average customer’s experience. Our View: How Does Dinnerly Stack Up in the Meal Prep Market? As our analysis shows, there are plenty of meal kit subscription options available for those who are looking to spend less time thinking about what to make for dinner each night. While meal kits will cost you more than buying ingredients at the store, they offer convenience and give inexperienced cooks the confidence to experiment with recipes. But does Dinnerly rise above the rest? Looking at the facts the company shared with us, as well as numerous customer reviews from multiple platforms, it’s clear that Dinnerly has branded itself as a lower cost option. Compared to the competition, Dinnerly meals are simpler; they have streamlined packaging, instructions, and even recipes. However, a lower price point might come at a cost, as many customers complained of missing or spoiled ingredients in their kits and slow customer response. Our experience with Dinnerly’s PR team didn’t fit this standard, as we found them prompt and accommodating to our requests for information. You won’t get the frills found in more expensive plans like Plated, but you’ll likely pay less per meal. So does Dinnerly make sense for your situation? If you’re trying to stay away from takeout, prefer more straightforward cooking instructions, and don’t want to take the time to plan out meals or go grocery shopping, then a meal plan like Dinnerly makes sense. If you're curious, consider giving Dinnerly a try. You can cancel your service at any time, so there’s little risk if you find that it’s not the right fit for you. Just got my first, and last, box. I used Blue Apron for years and got bored with their overly exotic, no-repeat recipes, so switched to HelloFresh. I stopped it when my husband died, but recently looked at Dinnerly as something I could use even though I'm by myself. The meals looked like they'd keep well for leftovers. Got my first box late this evening. Delivery guy never even rang the doorbell. It's just luck I found it. The packaging was terrible. Meat, cheese, and peas crammed into a plastic bag with an ice pack. The fresh peas were smashed. Vegetables were tossed randomly into the box. The hamburger buns were smashed by the two large russet potatoes and the ice bag. Everything else was just thrown in there. To make matters worse, when I logged in to get the recipes (why aren't they in the box? They don't have to be fancy), my password wouldn't work. I tried the password reset TWELVE TIMES and never received the link. I need access to my account in order to cancel this scam of a food kit delivery. I saw Dinnerly had charged my account. I thought I had canceled that week, but I guess I missed that one. I was not going to be home to receive my box for two weeks after delivery. I emailed Dinnerly and was contacted four days later, that I was too late. I was also told that as soon as I was charged that they immediately purchase the food and pack the box and they have absolutely no way of stopping the distribution of my order. They canceled my subscription and kind regards. Now I have food spoiling for weeks at my home because I was a couple of hours too late skipping that week at Dinnerly and they will not help the customer in any form. Other food box companies have no problem canceling and refunding, but Dinnerly can't. They charge you before you see the disgusting, unappealing, unhealthy options. The food arrives late with missing or wrong ingredients, and rotten vegetables. Customer service is a joke, the phone number apparently doesn’t work. I’ve used other services, and frankly, you get what you pay for with Dinnerly. Write a Review for Dinnerly!